This is one of our favorite "go-to" recipes. 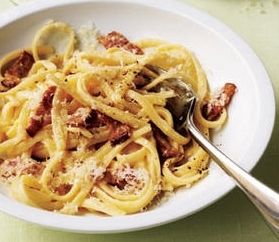 It is carbonara without the egg. It is simple, quick, and a classic, with the usual blending of wonderful taste and texture. And it is a major comfort dish for any evening that could use a little comforting. One evening, with a touch of chill in the air, my wife selected this recipe to get us into super spirits after a tough day. It worked. one pound linguine. This can be dried, or better, make your own fresh egg linguine. In a saute pan, cook the bacon until fairly crisp. Remove the bacon with a slotted spoon and drain on paper towels. If you want to go all out, keep two tablespoons of the bacon fat in the pan for the next step. If you are more into clean living, wipe out the pan and add the olive oil. Bring 4-5 quarts of water to a raging boil. Add a couple of tablespoons of salt. Put in the pasta, stirring well to get it mixed around in the water. Cook the pasta to al dente (test by trying it). Fresh pasta will be ready much more rapidly than dried. Reserve a cup of the pasta liquid. Drain. Add the pasta to the reheated sauce. Mix well. Add some of the reserved liquid as necessary to keep it moist. Add a couple of twists of fresh pepper from the pepper mill. Add the parsley and parmesan. Stir. Taste for salt and pepper. Serve on heated plates. Benisimo!